The foundation of all winemaking is the process of fermentation. During the fermentation process, yeasts turn the sugars in grapes into alcohol. The longer this process goes on, the less sugar remains in the wine; wines with little or no residual sugar are called "dry." By contrast, if the winemaker stops fermentation early, the wine will contain a high level of sugar, and be sweet. Even white wines made from the same grapes can vary in sweetness, although there are some general trends. For example, Italian pinot grigio is typically very dry, as is sauvignon blanc. However, there can be variation even within the same grape: American pinot gris, while still dry, is sweeter than its Italian counterpart, and New Zealand sauvignon blanc similarly tends to be sweeter than its French cousin. Sparkling whites vary similarly. For instance, wine experts subdivide Champagne into a number of categories. Brut contains the lowest amount of sugar, while doux contains the most. Nonetheless, most sparkling wines are still on the dry side. Although sugar content is the usual measure of sweetness, some dry wines contain more sugar than you might expect; the added perception of dryness comes from the acid or tannins present in the wine. Sweet whites include some rieslings -- others are only semisweet or even slightly dry -- as well as Moscato, Sauternes and Tokaji. 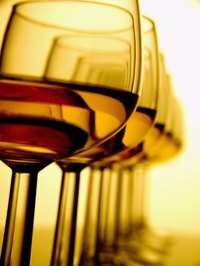 Dessert wines such as white port or Vin Santo are the sweetest of whites. The high levels of sugar in these wines result from different methods of production. For instance, the grapes used to make Vin Santo are dried before fermentation, removing much of their water content and increasing the concentration of sugar. Very dry red wines include Malbec, Bordeaux and Chianti; most red wines, including Beaujolais, Syrah and merlot, fall into the dry category. In general, drier reds tend to be more tannic, while sweeter reds, such as pinot noir, are fruitier. As with whites, tannins and acidity in red wines can make a wine seem dry even if it has a relatively high level of sugar. Sweet reds are outnumbered by their drier counterparts. Most sweet reds are fortified wines like port, Maury or Banyuls. These wines form an exception to the general rule that sweeter wines have less alcohol; during its creation, port's fermentation is artificially stopped when the winemaker adds brandy or another spirit to the mixture. This addition means that much of the sugar remains in fortified wines rather than being converted to alcohol; however, the added spirit also gives the wine a higher alcohol content. Wine Spectator: Ask Dr Vinny -- What Does Brut Mean in Terms of Champagne?